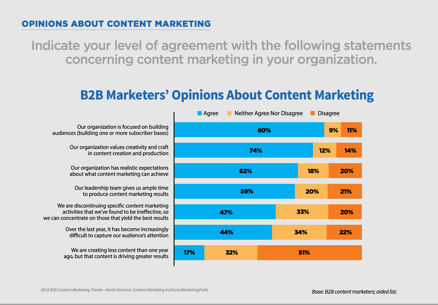 How often do you read the weekend posts on Content Marketing Institute the day they’re published? We can tell from traffic the answer is “sometimes” for many of you. Before I joined the CMI editorial team in September, the same was true for me. The daily alert went to my work inbox, which I monitored on the weekend only for urgent communications. Most of the time, as valuable as the CMI articles are, they didn’t qualify as urgent. Instead, like many of you, I reviewed them when my attention shifted back to work. So, it should come as good news that starting this month we’ll help free up your inbox on the weekends. Instead of posting to the blog every day of the week, we’re moving to a Monday through Friday schedule. Our daily alerts will continue to land in subscribers’ inboxes every weekday morning, but we’ll leave space on the weekends for you to pause and reflect. Some of you might be wondering about two weekend stalwarts – the PNR: This Old Marketing podcast and the Content Strategy for Marketers newsletter. Following the send-off episode on Dec. 11, PNR goes on hiatus. If you read A Content Marketing Love Letter, you know that CMI founder and PNR co-host Joe Pulizzi is setting off for some well-earned family time in early 2018 and “non-marketing writing projects (and other shenanigans)” thereafter. If you subscribe to the Content Strategy for Marketing newsletter, you should have received the revamped version in your inbox today. You still got an exclusive column from Chief Strategy Advisor Robert Rose and a link to our latest content strategy article. Now, you’ll also get a digest of the other content published that week. For years, Joe has encouraged companies to get strategic about their publishing frequency decisions. 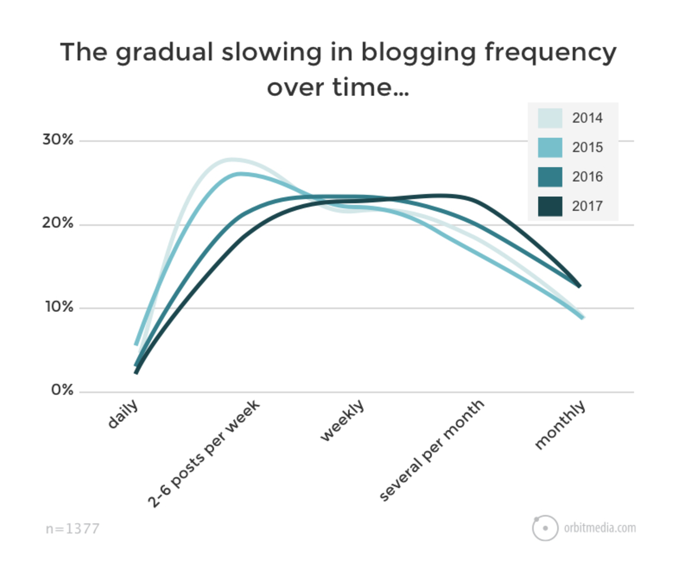 And just a few weeks ago, in PNR Episode 207, Joe and Robert talked about the latest research from Orbit Media, which shows a decline in publishing frequency (and an increase in post length) among individual bloggers. In the podcast, Joe points out that companies like About.com are getting great results by pulling away from publishing more and more answers (recipes for apple pie, for example). Instead, they’re curating lists of their best answers. That makes life easier for visitors. It’s easy to update and avoids the challenge of having your new content competing with your old content (a problem CMI has definitely experienced). We’re starting to see this trend in our own research, too. 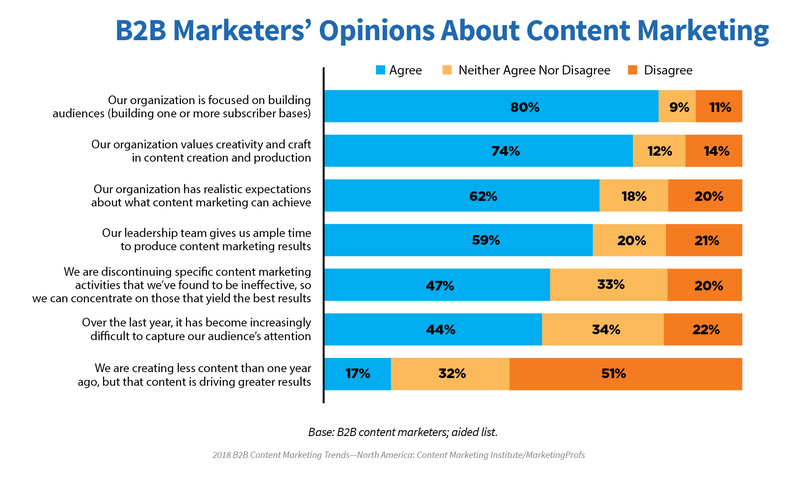 CMI’s 2018 study of B2B organizations found that almost half of B2B content marketers are creating less content than they did a year ago and driving better results from it. 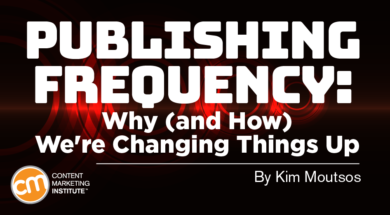 You may be wrestling with similar questions – how much content should you produce? Here’s how we’re approaching this latest experiment of forgoing new content on weekends. Are we publishing the right amount for our audience? Or are we just adding to the noise of their daily schedule? Are we publishing the right amount for our team or are we stretching our resources too thin? Are we getting the most impact from everything we produce? Michele got the ball rolling by sharing lessons learned from earlier experiments and insights from key statistics with Joe and Robert, of course, but also with our editorial, website, marketing, sales, SEO, and social teams. Organic search delivers the highest percentage of visitors on any given day. New posts account for a much smaller percentage of traffic overall. Since traffic dips dramatically on the weekend, we’re not anticipating too much of a traffic hit. Our search-optimized catalog still exists to answer questions no matter when someone is searching. And the extra time in our schedules will help us further optimize our best articles to make sure people can find them through search. We didn’t want to jeopardize the growth of our subscriber list, so we checked those numbers carefully. Again, weekends proved to be the lightest days for conversions. And, again, the door to becoming a subscriber is always open, whether we’ve published a fresh post that day or not. There just might be fewer people approaching the door on the weekends. Making the change to publishing original content only Monday through Friday isn’t the end of the decision. We’ll keep an eye on email opens, click-through rates, and unsubscribes. We’ll also monitor site traffic and conversions along with search rankings and traffic volume from organic. Our plan is to devote the extra hours in our week to optimizing and curating our existing posts on evergreen topics while continuing to spot trends and find the best advice on emerging topics that advance the practice of content marketing. And, of course, we’ll be listening to your comments and feedback. Let us know what you think – and what you might do with the gift of a few more uninterrupted moments in your weekends. Want to receive the Monday through Friday email or the weekly digest? Subscribe today. Kim Moutsos is thrilled to join the talented team at the Content Marketing Institute as vice president of editorial. After working in content marketing for enterprises and startups for more than 20 years, she’s looking forward to exchanging ideas and lessons learned with other content marketing practitioners. You can follow her on Twitter at @KMoutsos or connect on LinkedIn. Join Over 200,000 of your Peers! Get daily articles and news delivered to your email inbox and get CMI’s exclusive e-book Get Inspired: 40 Examples That Are Driving Content Marketing Forward FREE! CMI, a UBM Company, 2 Penn Plaza, 15th Floor New York, NY 10121 | Information about UBM entities and its affiliates can be found here.